Korea United Pharm. Inc., a local pharmaceuticals producer, launched a new social contribution project aimed at helping underprivileged senior citizens in Gangman-gu in southern Seoul on Monday. 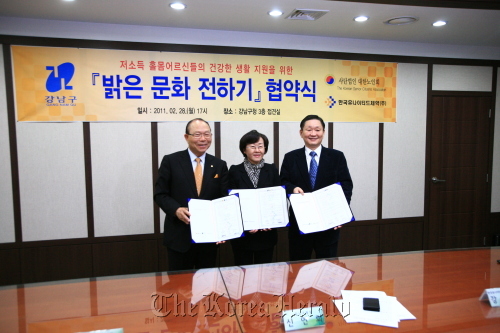 For the project, the company’s United Foundation signed an agreement with the Korean Senior Citizens Association and Gangnam-gu Office to collaborate on the project. Korea United Pharm CEO Kang Duk-young (right) with Gangnam-gu chief Shin Yeon-hee (center) and Korean Senior Citizens Association Chairman Lee Sim in Seoul on Monday. As part of the project, the company will supply heaters and household necessities to the district’s senior citizens living on government subsidies. Korea United Pharm will also provide sports equipment and health supplements, and support the activities of volunteers working on similar projects. According to Gangnam-gu officials, the district has the eighth largest number of people receiving government subsidies among Seoul’s 25 districts despite Gangnam-gu’s reputation as being one of the capital’s most affluent areas. Korea United Pharm also operates a number of other social contribution programs including volunteer work and scholarships for various underprivileged groups.